Menu path: TSR Admin Home > Technical Management > User Administration > Users > Manual User Administration. Step 1: Click on “Add new user”. Step 2: Enter necessary information and then click the OK button. Step 3: Enter personal information related to this user by selecting the “Person” tab. If you want to, you can add more user details by creating user details types under ‘Type Management’. 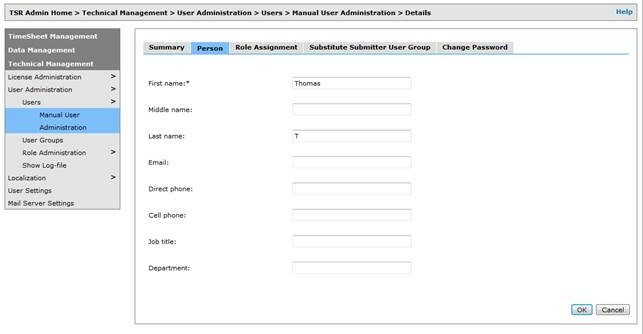 Step 4: Select the roles for this user in the “Role Assignment” tab. Select the roles by checking the corresponding check box. If you want this user to be able to submit time entries for other users via the web interface, select the “Substitute Submitter Role”. Step 5: If you want other users to be able to report time on behalf of this user, select the proper user group for this. Users in this group will be able to report time on behalf of this user. Make sure that you have checked the ‘Substitute Submitter Role’ at the ‘Role Assignment’ tab for users in that group. Step 6: Select which user groups the user should be part of. You can also manage this via your user groups directly. Step 7 (Optional): Change password for this user by selecting the “Change Password” tab. Then enter a new password for this user. Menu path: Technical Management > User Administration > Users > Manual User Administration. Step 1: Click on the user to be modified. Step 2: The information you can modify is grouped in tabs. Select the ones you wish to edit, enter the necessary information, and click OK.
Click the “Inactivate” link to inactivate the corresponding user, the link will then be changed to “Activate”. If you want to search for specific users, enter search criteria and then click the “Search” button. Click the “Activate” link to activate the corresponding user, the link will then be changed to “Inactivate”. With TSR DataBridge, you can import and edit your users in bulk.